Serves up to 4 | Wine to sip: Woodbridge 2010 Merlot by Robert Mondavi – I got a 1.5L bottle of this wine last week and it kept fresh for 3-4 days with a cork in the fridge. I had a lot of left over mashed potato. Quesadillas was an easy solution! 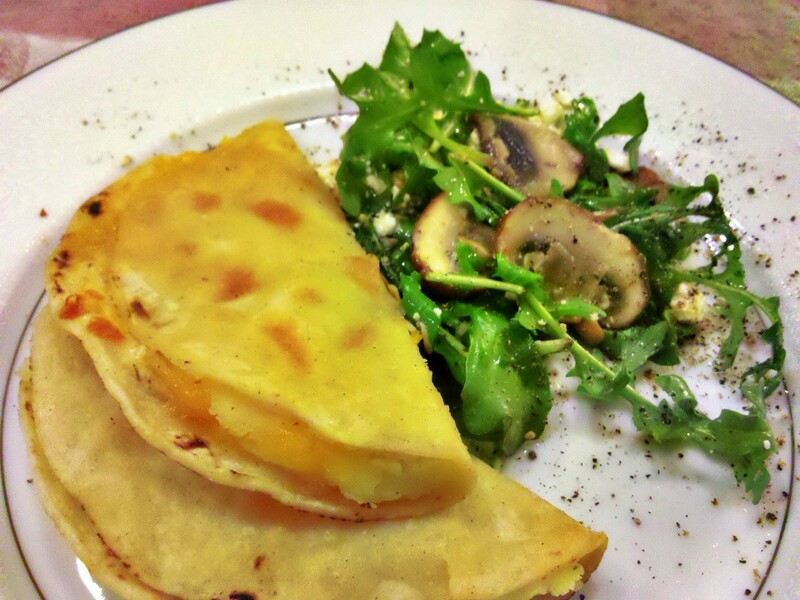 Add a side of Organic Arugula salad and you have a nice lunch or fun movie dinner. 4 ounces shredded Mexican blend cheese. 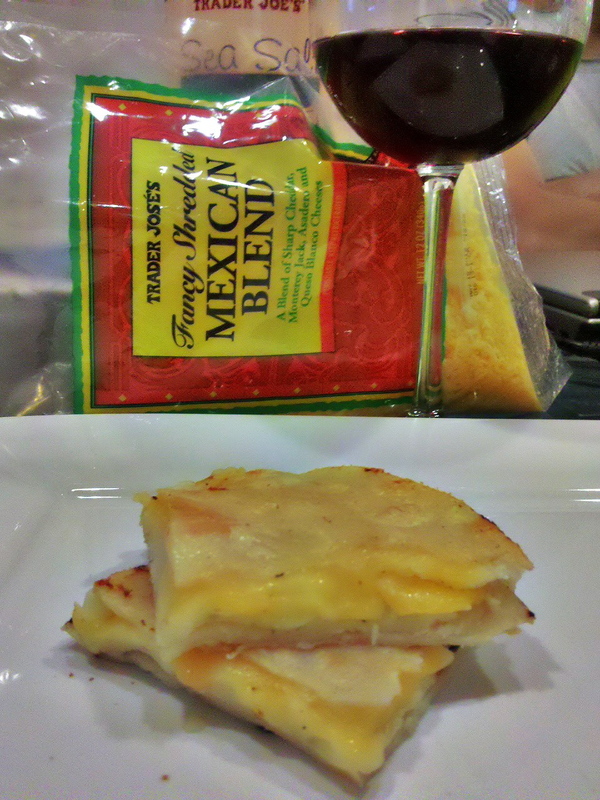 This might be a blend of Sharp Cheddar, Monterey Jack, Asadero and Queso Blanco cheeses. If tortillas are cold, warm them on a skillet to soften. Heat 2 tablespoon grapeseed oil in a large skillet to medium-high heat. 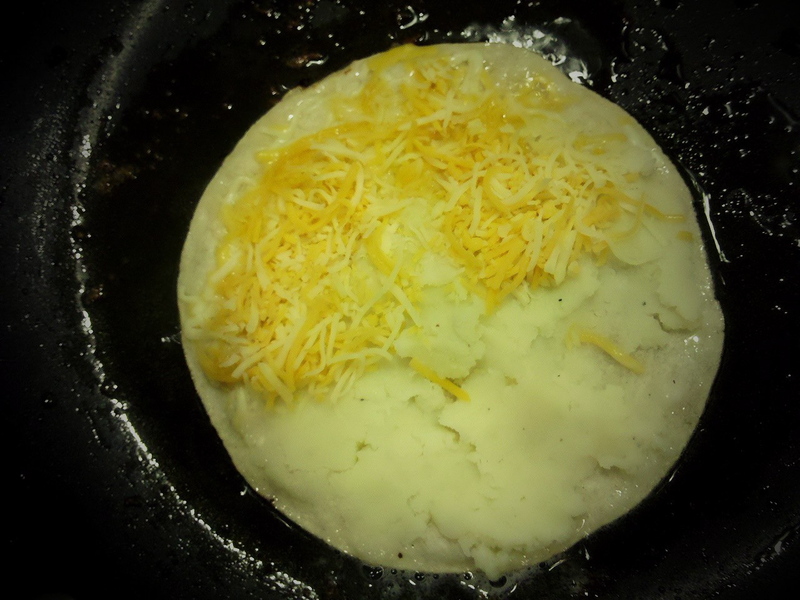 Spread about 1/4 cup mashed potato onto half of the tortilla. Sprinkle cheese onto other half of tortilla. Optional: Sprinkle sea salt to taste. Place tortilla onto hot skillet and fry for about 1 minute until tortilla is crisp. With tongs fold tortilla in half, drain excess oil and remove. In a medium skillet add 1 teaspoon grapeseed oil. Sautee mushrooms until golden 2-3 minutes. Season with ground garlic and remove. In a medium bowl toss arugula with extra virgin olive oil and balsamic vinegar. Top with mushrooms, feta and sunflower seeds. Serve salad with cracked peppercorn on the side for seasoning. Ha, nice! I came up with the same idea; I added sautéd onion, too; it’s kinda like a giant pierogi! Also, sliced green olives, or jalapeno-stuffed olives worked in it too. My mother-in-law makes these all the time. She adds a green leafy – I don’t remember the name – similar to loroco – you know the kind of cheese they put in Salvadorian pupusas “queso con loroco”. Stuffed olives sounds great … I love olives. Thanks for the new idea! Thanks for stopping by The Curly Haired Chica blog! Thank you so much for liking my post – This looks pretty yummy too! You’re welcome! My toddler is a picky eater but he loves pancakes so I always try to make them healthy by adding bananas, flax seeds, nuts, whole grains, etc … your zucchini pancakes definitely caught my attention.